Get out and get running this Bank Holiday Monday for the Our Town Fun Run! The run will take participants through four laps of Ringsend Park, ending as the Ringsend May Day Parade begins. There will be medals for both the men and women’s first places, and for the next ten people to cross the finish line. Our Town is an initiative that garden designer Diarmuid Gavin and architect Felim Dunne started, with the aim of inspiring communities to come together to restore local pride through regeneration. As a part of this, the Our Town Ringsend and Irishtown Initiative – made up of community leaders in Ringsend and Irishtown – has put together a five-year plan, which will see improvements made to the area with the help of the local community. The run begins at 12.30 and is free for all to take part in, but everyone must register. 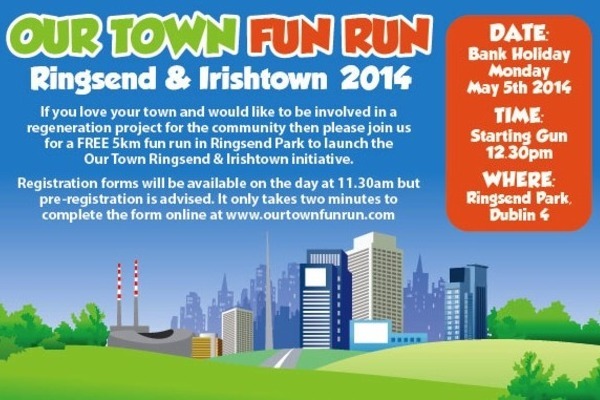 You can do this at Irishtown Stadium at 11.30 on the morning of the run, or by logging on to www.ourtownfunrun.com.